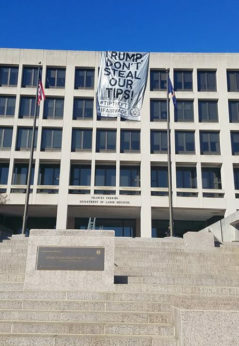 WASHINGTON—The workers call it “tip theft.” And 346,135 people have protested to the Trump Labor Department about its stealth scheme to allow bosses to steal their tips. The scheme is a new Department of Labor rule allowing managers and owners to take an up-front cut of the money tipped workers – restaurant servers and bussers, airline baggage handlers, taxi drivers and others get. That’s the opposite of what’s supposed to happen under federal minimum wage law. That law, the Fair Labor Standards Act, says if a worker’s tips don’t equal the federal minimum wage of $7.25 the boss must make up the difference. The tipped minimum is $2.13 an hour. It hasn’t risen in more than two decades. But now Trump’s DOL, at the behest of the National Restaurant Association, wants to reverse that demand for owners and bosses to make up the difference. Instead it wants to let the bosses take a share right off the top, before the workers get even a cut of their earned tips. And that sent the unionized Restaurant Opportunities Center, which speaks for low-wage restaurant workers in at least seven cities nationwide, and their allies into the streets. It also sent the 346,135 people to write to the DOL. “This new rule would constitute legalized theft of restaurant workers’ hard-earned tips by the National Restaurant Association and President Trump,” ROC founder and Executive Director Saru Jayaraman said in a statement. “The restaurant industry is the second largest and absolute fastest growing sector of the U.S. economy, but is also the lowest-paying, thanks to the lobbying prowess of the National Restaurant Association. The NRA’s greed has gone way too far. On top of lobbying for 80 years to keep the wage for tipped workers at a subminimum wage of just $2.13 an hour, they have also tried to get away with keeping their workers’ tips.” The NRA has also vociferously lobbied against raising the regular minimum wage. “Tipped restaurant workers in the United States are mostly women who struggle to make ends meet and suffer from the highest rates of sexual harassment of any industry in the United States because they must tolerate inappropriate customer behavior to feed their families in tips. Trump’s new rule would exacerbate sexual harassment as it would give employers extraordinary power over their workers’ tips,” added Jayaraman. 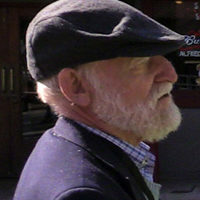 Calculations by the Economic Policy Institute, using federal data, show letting the owners and bosses skim from the workers’ tips could cost the workers – many of them in some of the lowest-paying occupations in the country – a minimum of $5.8 billion and a maximum of $13.2 billion yearly. substituting the restaurant owners’ scheme, but Trump’s appointees have deep-sixed it so far, drawing sharp criticism from Jayaraman and a demand from Sen. Elizabeth Warren, D-Mass., that the DOL release its findings. “You acted to hide this information from the public,” Warren wrote Acosta. The Trump tip rule and Acosta’s decision sent the workers and their allies into the streets in D.C., Chicago, New York, Seattle, Detroit and Springfield, Ill. The protest in D.C. was small, but dramatic. There, ROC representative Jessica Yanez led supporters in piling several dozen boxes, representing crates of petitions, in front of the six-story Labor Dept. headquarters. “Tips belong to the workers, not to the bosses,” she declared. “The Labor Department is supposed to protect the interests of workers,” Yanez said. Tip theft, she added, “is going to disproportionately affect women of color, single moms, LGBTQ people” and other victims of discrimination. Federal data show 85 percent of the nation’s “hosts, hostesses” and other restaurant workers are women. Yanez and the others hung a sign on the boxes with the number of protests sent to the DOL against its “tip theft” rule by the Feb. 5 deadline. 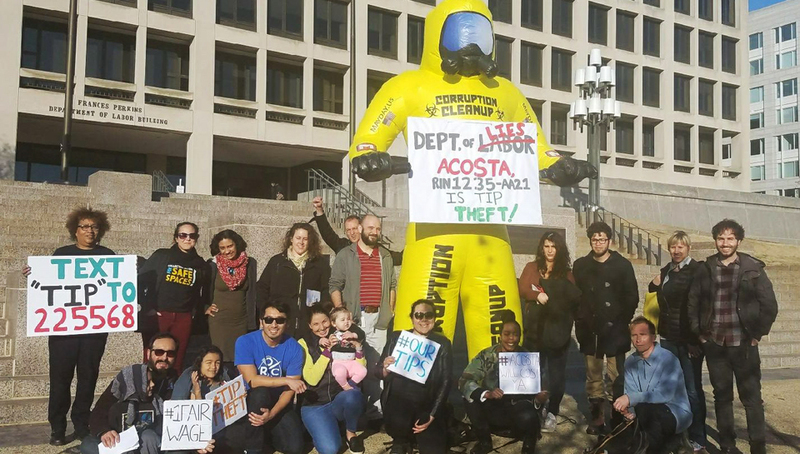 Standing beside was a giant inflatable puppet, “Corruption Cleanup Carl,” draped with a sign saying “Dept. of Labor Lies. Acosta: RIN235-M21” – the rule number — “is tip theft.” The “Acosta” is Alex Acosta, Trump’s Labor Secretary. But that wasn’t the high point, literally. Somebody got onto DOL’s roof, and draped a 9-foot silver-and-black bedsheet banner down the front of the building, above its front door. “Trump: Don’t steal our tips!” it read.